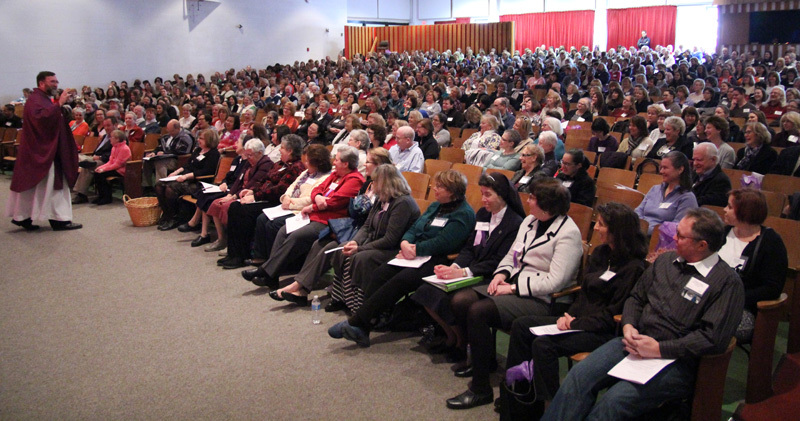 It says something about the faith at the grass roots of the Archdiocese of Philadelphia when more than 900 women and men, mostly lay volunteers, pause from their busy lives to spend time at a Saturday session to learn how to better share that faith with others. The occasion was the annual Catechist Convocation held this year at Archbishop John Carroll High School, Radnor, on March 5. Normally after 27 years, one might expect a program to be running just on force of habit, but this was the largest ever. “We are really blessed. It’s a wonderful opportunity for all of our teachers and our catechists to show that they are life-long learners and I think for us it is an opportunity to form them in the faith and to have them model for our children what life-long learning and evangelization looks like,” said Christopher Mominey, archdiocesan secretary for Catholic education. 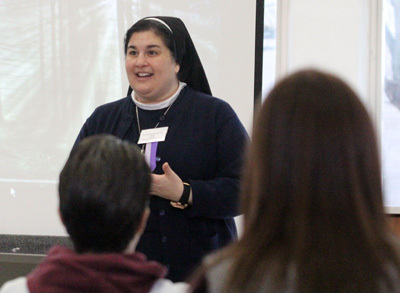 Mominey estimated about 35 percent of those attending were teachers at the Catholic schools, while the balance came from teachers in the Parish Religious Educations Programs (PREP). He noted virtually all the leaders of the 19 English language and three Spanish language workshops were local talent. Most were drawn from area colleges, schools, parishes and St. Charles Borromeo Seminary. It was drawn from a story Pope Francis told from his ministry years in Argentina. He would send groups of seminarians out into the unpaved barrios to be among the people. When they came back, he would look at their shoes. If they were not dusty he knew they did not do what he asked them to do. Father Chris Walsh, pastor of St. Raymond Parish in Philadelphia, celebrated Mass for the group, and his the focus of his homily was mostly on the readings of the day, particularly the parable of the Prodigal Son. He called attention to the Old Testament where God as Father is only mentioned 13 times. But in the New Testament he is mentioned 150 times, including 53 times by Jesus himself. “It was very clear that Jesus wants us to know God as the Father who loves us and knows us and will always, always be there for us,” Father Walsh said. Kathleen O’Connor of St. Anselm Parish in Philadelphia found the Mass very uplifting. The whole program “was wonderful, so invigorating,” said Nancy Franks of Mary Mother of Redeemer Parish in North Wales. She is also vice president of the Archdiocesan Association of Parish Directors, Coordinators and Administrators of Religious Education. As part of the morning Mass, Father Walsh asked those who attended to write on a slip of paper something they would ask God to grant for them. “I asked God to give me the grace to let something go that is bothering me,” Franks said. “I asked for a little bit more patience, the gift of patience for myself and my family,” Mominey said.